Hollis made all 68 of his college extra point attempts and kicked a 56-yard field goal against Arizona in 1993. Undrafted by the NFL, he was with the San Diego Chargers during the 1994 preseason and then caught on with the expansion Jaguars in ’95. 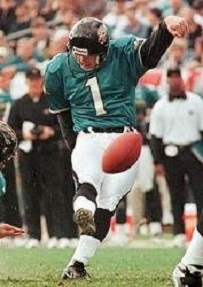 Hollis was successful on 20 of 27 field goal attempts and 27 of 28 extra point tries and improved in 1996 to 30 of 36 in field goals and made all 27 PAT attempts as the team reached the postseason, where he was successful on 8 of 9 field goal attempts in the three-game run through the AFC title contest. Jaguars went 11-5 to finish second in the AFC Central while ranking third in the NFL in scoring (394 points) and qualified for the postseason as a Wild Card. Lost AFC Wild Card playoff to Denver Broncos (42-17). Hollis spent four more seasons with the Jaguars and had his best field goal percentage (92.3) in 2000 when he was successful on 24 of 26 attempts. While he sometimes had difficulty on kickoffs, he was generally accurate on field goals. After faltering in 2001, when he missed ten field goals and his accuracy dropped to 64.3 percent after never being below 80 percent since his first year with the team, Hollis departed for the Buffalo Bills in 2002. He made good on 25 of 33 field goal attempts (75.8 %) and all 40 tries for extra point. Hollis moved on to the New York Giants in ’03 but was placed on injured reserve with a back injury in the preseason and retired the following year. Overall, Hollis kicked 200 field goals out of 250 attempts (80.0 %), with 175 of 217 (80.6) coming with the Jaguars, and added 279 PATs for a total of 879 points scored (764 with Jacksonville). He added another 16 field goals, out of 18 attempts, and 22 extra points in eight postseason games, all with the Jaguars.